Former Montreal Alouettes running back Cierre Wood has been charged with the murder of his girlfriend's daughter in Las Vegas, reports ABC 57. Wood, 28, and his girlfriend, 25-year-old Amy Taylor, were already facing charges of first-degree child abuse/neglect, but the charges were upgraded following the death of the five-year-old child on Thursday evening. The initial arrest occurred on Wednesday. A standout at Notre Dame, Wood spent the 2017 season on the Als' roster after being acquired from the Hamilton Tiger-Cats. He spent part of 2018 on the Winnipeg Blue Bombers' practice squad. A native of Bloomington, CA, Wood played in seven NFL games over three seasons with the Houston Texans, New England Patriots and Buffalo Bills. 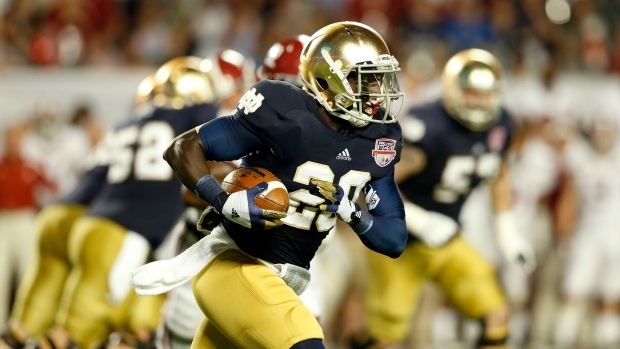 Wood was a member of the 2012 Fighting Irish team that went to the BCS National Championship Game, falling to Alabama.